Photo Galleries Tree of Light My Rotary - I didn't think that I could afford it. Fun & Fellowship Rotary Shoebox Appeal Remembrance Parade Awards Santa's Grotto Annual Poppy Appeal Garden of Reflection Community Service Christmas Tree Festival Poppy Concert My Rotary - As the first female member in Aldridge Beer & Buses Festival Aldridge Health Walk My Rotary - Fitting it in around work Youth Activities & Competitions Woodlands Family Adventure Day Get Involved My Rotary - No-one in my family had been in a service club Lend with Care Microfinance Are you interested in Joining Aldridge Rotary Club? A walk of around 1.3 miles routed around the village to pass benches where you may choose to rest a while. 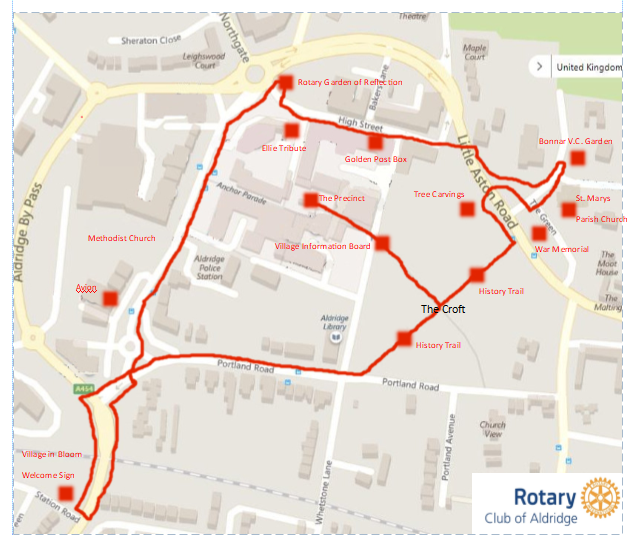 Working within our community, the Rotary Club of Aldridge has a proposed route around the village that will not only help you to maintain health and vitality, but also enable you to experience the pleasure of a ‘country walk’, within our urban village. 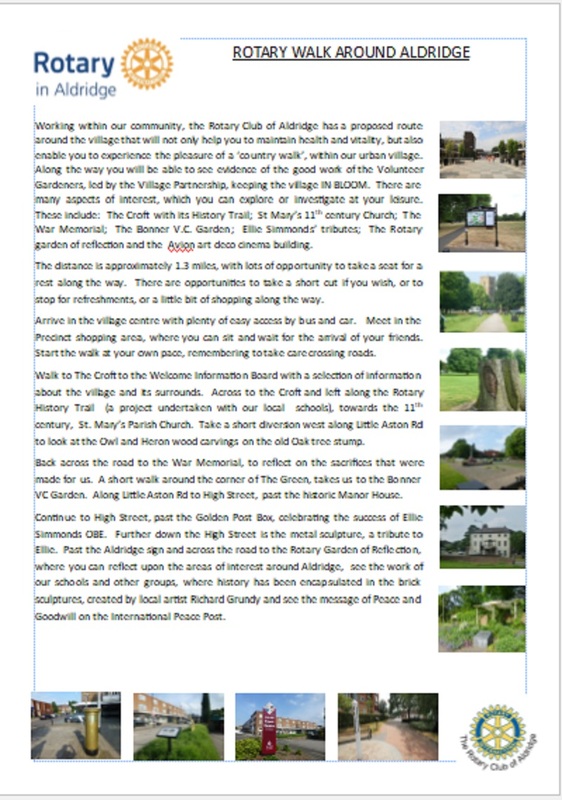 Along the way you will be able to see evidence of the good work of the Volunteer Gardeners, led by the Village Partnership, keeping the village IN-BLOOM. There are many aspects of interest, which you can explore or investigate at your leisure. These include: The Croft with its History Trail; St Mary’s 11thcentury Church; The War Memorial; The Bonner V.C. Garden; Ellie Simmonds’ tributes; The Rotary garden of reflection and the Avion art deco cinema building. The distance is approximately 1.3 miles, with lots of opportunity to take a seat for a rest along the way. 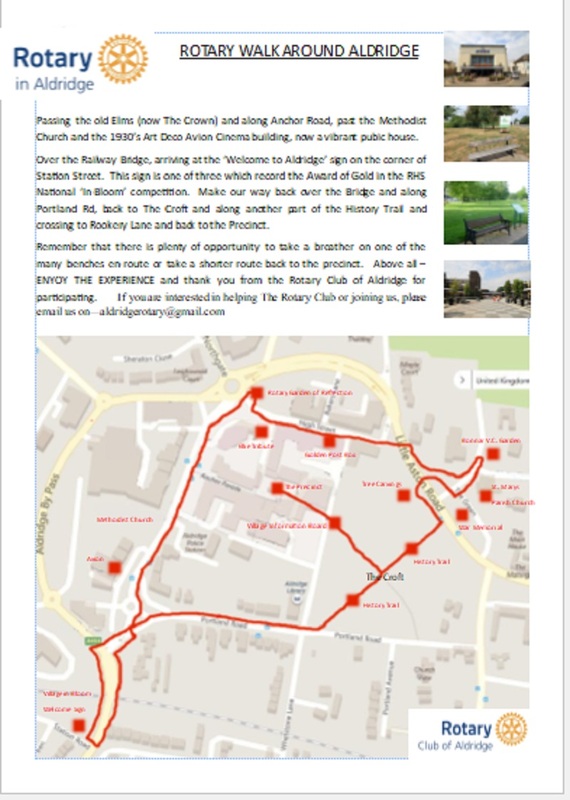 There are opportunities to take a short cut if you wish, or to stop for refreshments, or a little bit of shopping along the way.